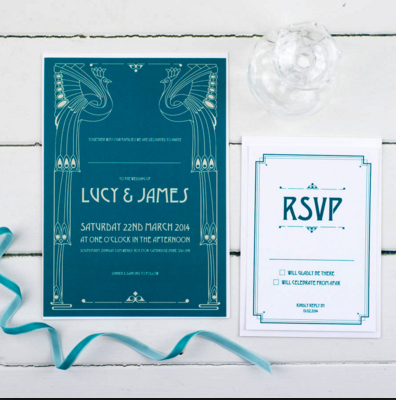 Inspired by the stupendously glamorous Art Deco era of the 1920’s and 30’s, the Art Deco wedding invitation simply exudes endless style and elegance in abundance! This beautiful design from Russet & Gray gets us all giddy and excited at the thought of flapper girls and dapper gentlemen dancing the night away to the music of a live swing band after celebrating the communion between two esteemed families. Perfectly suited to both indoor and outdoor weddings held at any time of year, this stunning design lends itself to a wide range of wedding celebrations and styles. The carefully crafted invitations feature intricate peacocks, standing as pillars at either side of the wording, symbolising the coming together of two beautiful and sophisticated people as they become one entity through the majesty of marriage. Professionally printed onto the highest quality 300gsm card, this superb design is not only perfectly executed in its creation, but also totally customisable, so if teal doesn’t match the rest of your wedding, we can help you choose a colour that does! If you’re looking for a comprehensive wedding suite that includes everything you could possibly need then you’re in luck, as the Art Deco design is also available as a Save the Date, RSVP, Order of Service, Thank You and information cards, as well as menus, table numbers, table plans and place cards! Each element of this wonderful wedding suite looks and feels extravagant; we’re certain it will impress every one of your guests, regardless of age. Tags: 1920s, Art Deco, Sophisticated.